The Mason Core is designed to complement work in a student’s chosen area of study. These classes serve as a means of discovery for students, providing a foundation for learning, connecting to potential new areas of interest and building tools for success in whatever field a student pursues. 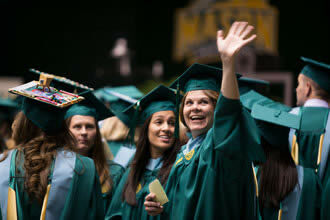 Fulfills Mason Core requirement in social and behavioral science. Description: This course examines disability, past and present, in American culture through changes in historical, political, legal and societal responses to people with disabilities. Analyzes the disability experience through social and behavioral science perspectives, including diversity, bio-ethical and human rights conceptualizations/constructs of disability. "I would recommend this class to all Mason students. The course is engaging and thought provoking. All of the projects that you work on will help you understand the subject matter and how the material applies to your life. I learned so much that I was able to use in the classroom and in my own life. I was able to identify and work through my own biases of people with disabilities, and I now look at the world differently because of this class."